Believe it or not, QuickTime turns 25 years old this year. The multimedia software that debuted with System Software 6 (?!) soon became the de facto method for playing video on the Mac, eventually introducing an optional Pro upgrade that allowed users to perform basic edits, merge files, and export to supported video codecs. With the release of Mac OS X Snow Leopard and QuickTime X in 2009, Apple went back to basics, stripping QuickTime Player X of most pro-centric functionality. Over time, some features like trim would return, but in the eyes of power users, the damage was done. There’s been no shortage of powerful media players ever since, many capable of playing just about any file you can throw at it, even without proper codes installed. But these alternatives are often designed for power users, rather than content creators who require a fast, lightweight player for reviewing files. Pro Player 2 isn’t the cheapest QuickTime player around, but it’s definitely one of the few designed with pro content creators in mind. Pro Player 2 falls into the latter category, but it’s important to note up front this application is designed strictly for playback of MOV, MP4, and audio files, rather than the “everything but the kitchen sink” approach of open-source players like VLC. There are no editing tools or MPEG support, and if you’re hoping to rip Blu-rays to MKV and watch on the Mac, you’ll be disappointed. In addition to playback, Pro Player 2 includes a Browser for managing favorite folders, recent files, and more. In addition to playback, the app includes a Browser where users can add frequently-used folders or access recently opened files, along with a faux “desktop” for previewing multiple files, complete with interactive thumbnails you can scrub through. But it’s not cheap: After a brief flirtation as a free app with optional Plus Pack upgrade to unlock higher-end features, Pro Player 2 now costs a flat $30 starting with version 2.1. That’s just as well, because the app is designed as a companion to traditional content creation software like Final Cut Pro or After Effects, which cater to a non-consumer audience. Instead of waiting for heavyweight applications to launch just to take a quick spin through a QuickTime file, Pro Player 2 allows you to dive in immediately with few compromises. Compared to other media player apps, Pro Player 2 can be controlled almost entirely from the keyboard. For starters, the player implements familiar “JKL” shortcuts found on most editing software, used to play backwards, pause, or play forward; each additional press shuttles playback faster in the desired direction, or you also can click and hold the mouse to shuttle or jog. Keyboard shortcuts are prevalent in Pro Player 2, which can also be used to key in specific timecode numbers like a pro. 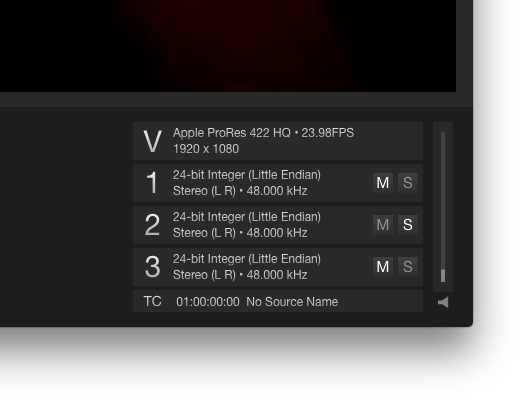 In addition to playback, there are keyboard shortcuts for toggling between Browser and Player modes, full-screen viewing (with or without on-screen controls), and the ability to mark in/out points to play or locate specific sections a video; clicking the current time display can also be used to precisely jump to a specific frame. The M key mutes all audio playback, and motion graphics designers can even toggle alpha channel display. 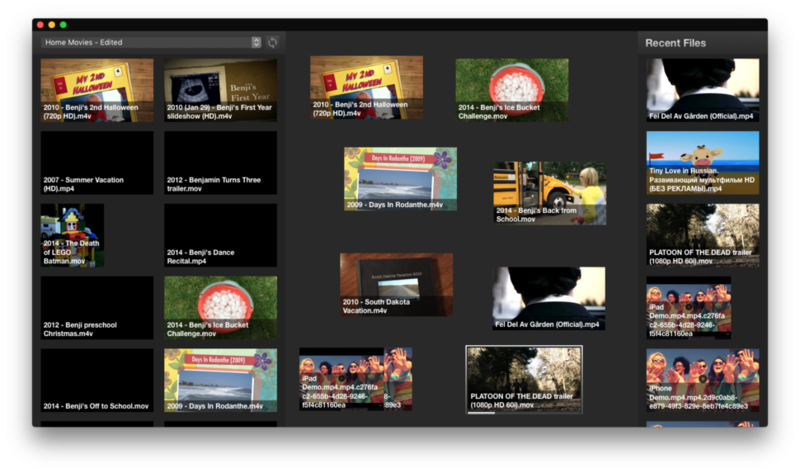 Like QuickTime Player X, Pro Player uses a dark background theme to keep the focus on the content being played. 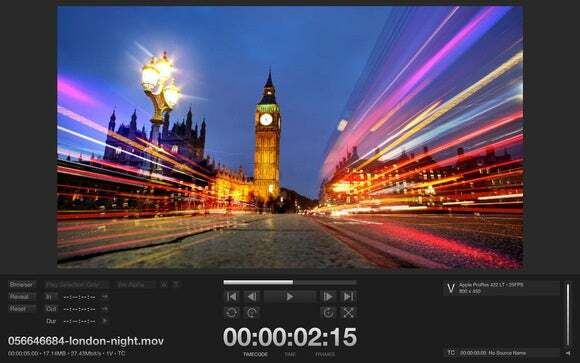 But that’s where the similarity ends: The user interface has the familiar look and feel of video editing software, with selection, playback, and audio controls left, right, and center, respectively. If the open file contains a timecode track, Pro Player displays it by default, but users can also view in absolute time or frames. Need to play a specific section of a video repeatedly? Mark in and out points to limit Pro Player 2 to only that selection. Pro Player shows the file name in the lower left corner, complete with runtime, file size, data rate, and number of tracks. 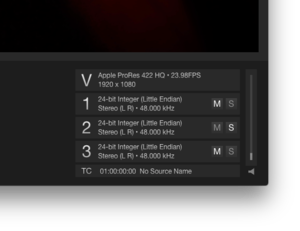 Video format, frame rate, and size information is displayed at right, along with accompanying audio format, track arrangement, and bitrate; for multitrack QuickTime files, individual audio tracks can be muted or soloed, with a single fader to control volume. Audio or video files with multiple channels can be independently muted or soloed for previewing specific tracks. Aside from a slightly more affordable price, there’s really only one thing Pro Player 2 needs: Support for video playback to external devices from manufacturers like Blackmagic and Matrox. I have two such pieces of Thunderbolt hardware attached to my 15-inch MacBook Pro with Retina Display, but neither outputs audio or video to my connected monitors. This means playback is only as accurate as attached Mac display, which isn’t recommended for color or other quality control, particularly with older interlaced video files. As a companion app for content creators, Pro Player 2 is well worth the asking price, but the lack of external display hardware support keeps it from being as “pro” as it could be.